Leadership contest for Britain's Labour Party: What does it mean for Russia? 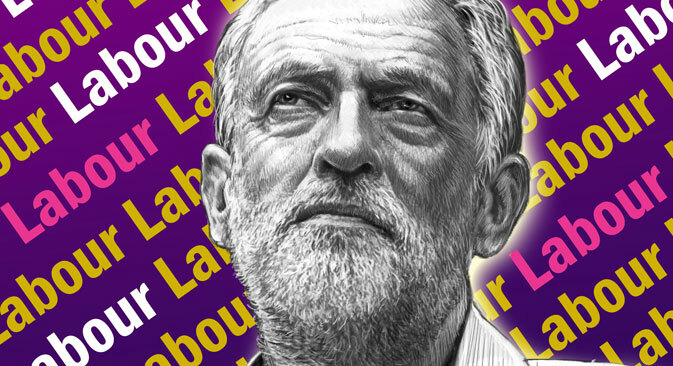 Jeremy Corbyn’s probable election as Labour Party leader will deal a hammer blow to Britain's Atlantic consensus. Moscow should celebrate this but be wary of the ruling Conservatives using Russia as a political football in attempts to damage their radical opponent, says Bryan MacDonald. I’ve never seen anything quite like the London establishment media reaction to Jeremy Corbyn. Even the hysteria over Scottish independence or the awful treatment of Neil Kinnock in the 90s pales by comparison. The relentless smear campaign seems to be having the opposite effect than intended. Instead of weakening Corbyn’s leadership campaign, the slurs seem to strengthen it. This is indicative of a growing resentment across the western world, towards the neoliberal elites who have dominated politics since the Reagan and Thatcher eras. It also suggests that "Fleet Street" no longer enjoys the power to decisively influence elections. The very notion would have been unfathomable during the Tony Blair years. Back then, securing Rupert Murdoch’s support meant more to the former Labour leader than winning the backing of some elements within his own party. Blair obsessed about finding a place in the Australian-born newspaper magnate’s good books, as documented in numerous memoirs of the period. From a Russian point of view, it’s telling how many American activists who specialize in Moscow-bashing are vehemently working to discredit Corbyn. This is a new dimension. Just a few short years ago, foreign news services had little or no influence on domestic UK politics. The popularity of increasingly transnational online news portals has radically altered the whole dynamic. Corbyn has been painted in U.S.-orientated media as a “useful idiot” for Putin. Meanwhile at home, on Aug. 11, The Times, Newsweek, Telegraph and Independent all ran smear stories, suggesting that Corbyn was calling for closer ties between Britain and Moscow. Many observers have suggested the attacks were coordinated or ‘steered’ by some think tank or other. His frequent appearances on alternative news outlets like Al Jazeera and Press TV are interesting. Not in what he says. Rather that he’s spent so much time on them in the past. I doubt it’s because the leadership candidate is a big fan of the countries that sponsor them. It seems more likely that the UK mainstream media has been closed to his views. The career left-winger is surely aware that modern Russian bears hardly any relation to its communist predecessor, the USSR. In fact, after the bandit capitalism of the 90s, one could argue that Russia is currently Europe’s least socialist major economy. Corbyn continues a trend visible in almost all western societies now: Anger with elites and feelings of disenfranchisement from the political system. Voter turnouts in established democracies have stooped to unfathomably low levels. In the UK’s most recent ballot, last May, non-voting would have won the election if it were a party. It’s not restricted to Britain. Witness the rise of Bernie Sanders in the U.S., the Sweden Democrats and Italy’s Beppe Grillo. It could be argued that Barack Obama’s election eight years ago was a protest vote, even if he eventually turned out to be far from a radical chief executive. The cause is quite obvious. For the first time since the post-war boom years, real incomes are stagnating. Meanwhile, the rich are having a ball. Russia itself is now entering the same territory after recent resource price corrections. How the Kremlin reacts to growing discontent will shape the future of Russia’s relations with both friends and rivals. Neo-liberalism has created, in almost every western democracy, a two-party system where the nominal left and right blocs don’t greatly differ. That is probably about to change. Most, but not all, anti-establishment political groupings in Europe oppose NATO. Some of these may be close to power. Ireland’s Sinn Fein, Spain’s Podemos and France’s Front National for instance. What makes Corbyn interesting is that the UK has long been NATO's (and America's) most passionate European advocate. Should Corbyn become leader of Britain's parliamentary opposition, the whole dynamic could dramatically change. It’s interesting that Corbyn blames NATO, not the Kremlin, for the conflict in Ukraine. The ruling Conservative party will have a stark choice. They can either listen to public discontent and soften their hard-line policies. Or they can drift even further to the right. The UK’s corporate media alleges that Corbyn is too left-wing to be electable. Oddly, they made the same claim about Scotland’s SNP. In May, the SNP won 56 of Scotland’s 59 Westminster seats. The Scottish Nationalists achieved this by mobilizing a substantial number of people with no previous record of political activity. Combined with their traditional core voters, this triggered a political earthquake. Labour, and Russia, will hope that Corbyn can repeat the same trick in the rest of the UK. Bryan MacDonald is an Irish journalist who focuses on Russia and international geopolitics.